(commonly RTA – road traffic accidents) kill nearly 1.3 million people every year and injure or disable as many as 50 million more. They are the leading cause of death among young people aged 15–29 years. In October 2005, the United Nations General Assembly adopted a resolution which calls for governments to mark the third Sunday in November each year as “World Day of Remembrance for Road Traffic Victims”. The day was created as a means to give recognition to victims of road traffic crashes and the plight of their relatives who must cope with the emotional and practical consequences of these tragic events. First Aid to Save a Life Pakistan encourages our young generation and respected parents to support safe driving behavior and through education and training before any young child get access to any type of motor like bike or car. They should also adopt correct behavior to ensure occupants (passenger, children and/or infants) safety and must have proper restraints for them too. Traffic fatalities are the leading cause of death for people ages 15-45 worldwide, resulting in 1.3 million deaths per year. 85% of traffic fatalities and 96% of child traffic fatalities occur in low- or middle-income countries. Many road traffic crash victims are the primary income generators for their family. The injury or death of these victims negatively impact the standard of living for their entire family. People who survive the initial crash frequently suffer brain damage that impedes their ability to continue as an income generator for their families, and in fact may require a lifetime of personal care that can drain resources from already impoverished families. Helmet use makes a difference. Appropriate helmet use reduces the risk of fatality by an average of 42% and of severe head injury by 69%. A recent case study of motorcycle accidents from Los Angeles and Thailand similarly found that that un-helmeted riders were two to three times as likely to be killed and three times as likely to suffer a ‘disastrous outcome’. Of survivable crashes, universal helmet use would have prevented about 80% of fatalities and brain injuries. 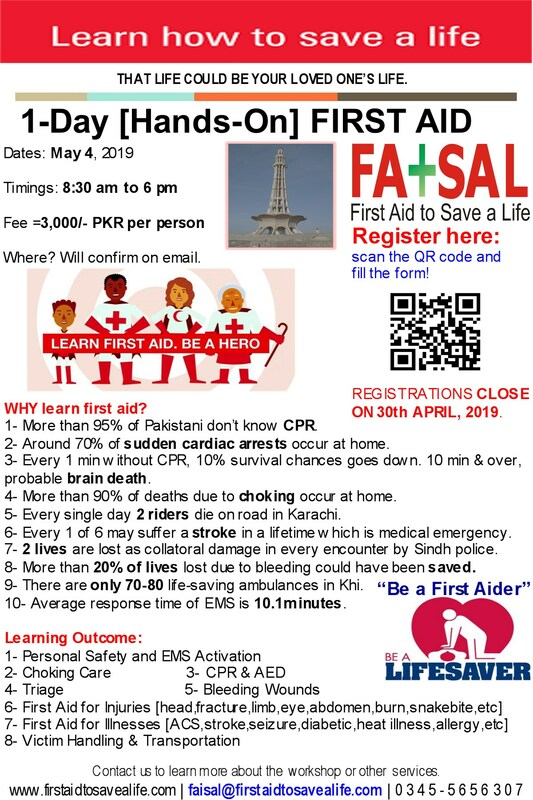 The goal of training programs offered by First Aid to Save a Life Pakistan is to help you gain the knowledge, skills, and confidence necessary to manage a medical emergency until more advanced help i s available. Emergency First Aid does not require you to make complex decision or have in-depth medical knowledge. It’s easy to learn, remember, and perform. Being volunteer is very good and our social and ethical responsibility to help victims and provide first aid (if trained to do so) but have to remain extremely careful if you are providing first aid on or near a roadway. Each year, many people are struck and killed by motor vehicles while providing assistance. On this World Day of Remembrance for Road Traffic Victims, let us mobilize all possible contributions; knowledge and experience; to improve road safety. Let us honor those who have lost their lives on the world’s roads by acting to save lives. This entry was posted in 1-Day Training Programs, emergency care and first aid, Emergency First Aid, UN Annual Events, World Day of Remembrance for Road Traffic Victims and tagged burden of road accidents, burden of road accidents on development, burden of road accidents on economy, emergency first aid, emergency first aid skills and World Day of Remembrance for Road Traffic Victims, first aid for abdominal injuries, first aid for brain injuries, first aid for burn, first aid for fracture, first aid for head injuries, first aid for head trauma, first aid for limb injuries, first aid for road accidents, first aid for road traffic accidents, first aid for road traffic victims, first aid for road trauma accident, first aid for roadside trauma, first aid for RTA, first aid for trauma, first aid trainings and road crashs in pakistan, first aid trainings to manage emergency first aid skills and road crashes, guide to administer first aid to road traffic accident victims, HAINES, HAINES Position, Helmet use makes a difference, Helmet use save from brain injuries, Helmet use save from severe accident, How Pakistan commemmorated the World Day of Remembrance for Road Traffic Victims, how to drag out a patient from car, how to remove car crash injured person, how to remove car crash victims, leading cause of death, leading cause of death among young people, leading cause of death among young people aged 15–29, leading cause of death among young people aged 15–29 years, personal safety the top most priority in emergency first aid, recovery position, road crash and brain damage, road crash and brain injury, road crashes and first aid training providers, road traffic accidents, road traffic accidents and first aid training providers in pakistan, road traffic accidents in pakistan and emergency first aid skills, Road traffic crashes, road traffic crashes and first aid skills, Road traffic crashes are predictable and can be prevented, Road traffic crashes are robbing communities and developing countries of their future, RTA, RTA - road traffic accidents, RTA and brain injuries, safe driving behavior, safe driving behavior and through education and training, safe driving behavior education, safe driving behavior education and training, safe driving behavior training, step by step guide to administer first aid to road traffic victims, UNGA, United Nations General Assembly, United Nations General Assembly Resolution, victims of road traffic, victims of road traffic crashes, World Day of Remembrance for Road Traffic Victims, World Day of Remembrance for Road Traffic Victims 2011, World Day of Remembrance for Road Traffic Victims 2018, World Day of Remembrance for Road Traffic Victims 2019, World Day of Remembrance for Road Traffic Victims 2020, World Day of Remembrance for Road Traffic Victims in Pakistan, young driver die early, young drivers die young. Bookmark the permalink.